Pantone’s Color of the Year, Greenery. Happy 2017! Working with this group of young aspiring women certainly keeps me on my toes! They are forever pushing me towards new apps, staying up to date with my phone, music, fashion, and so much more! It has been brought to my attention by the girls that Pantone, the authority in color, has announced it’s 2017 color of the year, Greenery! It just so happens that this is one of my favorite colors, outside of the Asian Jute you’ve all come to know and see in the salon. You will notice it as a secondary color predominately used in the spa, and my home. It’s on the wall paper, and the doors throughout the salon and spa. The version I lean towards is called Marat Apple from California. I am happy to welcome it to the fashion world and interior design inspirations. To me, it brings a sense of calm, a yellow green that evokes a peaceful, warm feeling. Bright, yet balanced and not overwhelming. It incorporates so much of what inspires us in nature, bringing the peace of the outdoors into our lives everyday day, reminding us to look for harmony and balance. That’s what we are constantly looking to achieve at Debony for you, harmony and balance. That effort transcends into looks that we create, that work for you and your lifestyle. Hair designs that elevate your confidence, balancing face shape, hair volume, and texture. Bringing harmony and balance to your bodies and skin through the use of massage, facials, and various spa services. It empowers and inspires us to continue doing what we love: green for 2017. We got together to create a few looks that were inspired by this green hue. In our newsletter this month, we included a few of the inspirations that came out of a work session we did together. We hope you enjoy them and are inspired to incorporate your own version of green into your world: a green hand bag or lunch tote, a green shadow, maybe a little shock of green in the hair! 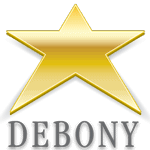 Book your complimentary make-up application with Debony. Warm regards and best to you in 2017! PreviousPrevious post:What is a Make-up Artist?NextNext post:It’s all about YOU this month!